Not Dreaming Yet ~ Roundball Manor - The House that Basketball Built. With a smaller roster for the Olympics this year, we can expect Team USA to play a quicker style perimeter game, find the open man and take the open shot every time. That is exactly what they did last night, and Brazil was more than happy to give them those open looks. Team USA came out flat last night, missed lots of open jump shots, and watched Brazil jump out to a 27-17 lead after one quarter. The US must establish themselves down low and work the inside outside game if they want to dominate games early. LeBron and Melo need to work from the low post and stop. shooting. jumpers. The Case for Kevin Love. One glaring weakness prevalent all night was the lack of inside game for Team USA. With Carmelo Anthony starting at power forward, you would think he should set up on the low block and use his quickness to his advantage. But no, Melo was hanging around the 3 point line all night, hoisting up shots and going 1 for 7 from the field. He is most effective DRIVING TO THE LANE, not going ISO and taking bad shots. When the shots aren't falling, this team is going to be in trouble against better teams like Argentina and Spain. If this happens again, Team USA needs to insert Mr. Kevin Love, the only true power forward on the entire roster. Love has a killer inside/outside game that should translate perfectly to the international game. Love had a better FG %, 3PT %, FT %, averaged 7 more rebounds and 4 more points per game. Melo is 6'8", 230 pounds, and Love is 6'10", 260 pounds. Love averaged 26 points and 13 rebounds a game this past season. He can post up AND knock down the three. Why is he not playing more? Is Coach K saving him as his secret weapon? Five minutes for Love last night does not cut it. He could spell Tyson Chandler as backup Center and draw the opposing big man out of the paint, opening up the entire floor for the rest of the team, not to mention his monster rebounding skills. 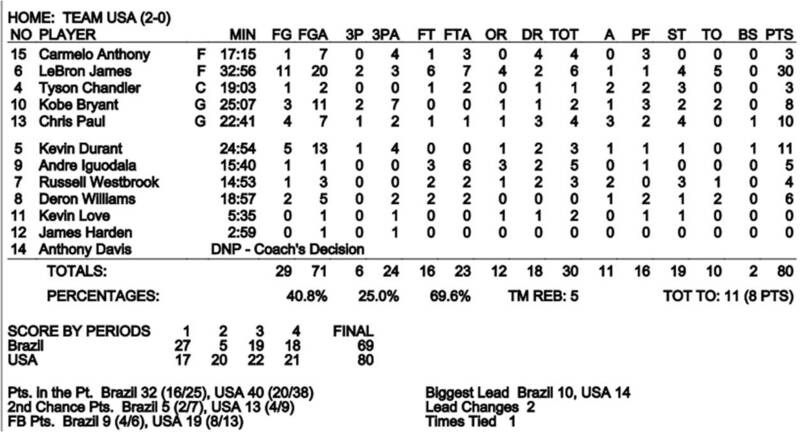 Last night Brazil out rebounded the US 38-30. We are not going to dominate if we continue playing James, Durant, and Anthony in the back court. They need Chandler or Love in at all times to help lock down loose rebounds and control the paint. Last night for Brazil, Anderson Varejao had 13 rebounds, and Nene and Tiago Splitter had 6 a piece. For the US, Tyson Chandler had 1. ONE. Melo had 4. That will not suffice against the Gasol brothers of Spain. Here's the box score from last night: Aside from Bron's 30-6-4, not much else sticks out. Iguodala will be playing major minutes, as his defensive versatility will be a big help. It was also fun to watch Deron Williams and Westbrook share a back court, those two should provide a big punch off of the bench. The team still has a few more practice games to tweak their game plan and rotation. Expect a blowout against Britain on the 19th, with their true tests coming up against Argentina on the 22nd and Spain on the 24th. Only time will tell. Let's go USA!